This highly-anticipated follow-up to Mark F. Horstemeyer’s pedagogical book on Integrated Computational Materials Engineering (ICME) concepts includes engineering practice case studies related to the analysis, design, and use of structural metal alloys. 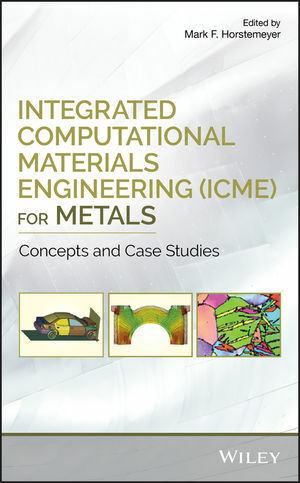 A welcome supplement to the first book—which includes the theory and methods required for teaching the subject in the classroom—Integrated Computational Materials Engineering (ICME) For Metals: Concepts and Case Studies focuses on engineering applications that have occurred in industries demonstrating the ICME methodologies, and aims to catalyze industrial diffusion of ICME technologies throughout the world. The recent confluence of smaller desktop computers with enhanced computing power coupled with the emergence of physically-based material models has created the clear trend for modeling and simulation in product design, which helped create a need to integrate more knowledge into materials processing and product performance. Integrated Computational Materials Engineering (ICME) For Metals: Case Studies educates those seeking that knowledge with chapters covering: Body Centered Cubic Materials; Designing An Interatomic Potential For Fe-C Alloys; Phase-Field Crystal Modeling; Simulating Dislocation Plasticity in BCC Metals by Integrating Fundamental Concepts with Macroscale Models; Steel Powder Metal Modeling; Hexagonal Close Packed Materials; Multiscale Modeling of Pure Nickel; Predicting Constitutive Equations for Materials Design; and more. Integrated Computational Materials Engineering (ICME) For Metals: Case Studies is a must-have book for researchers and industry professionals aiming to comprehend and employ ICME in the design and development of new materials. MARK F. HORSTEMEYER, PHD, is currently a professor in the Mechanical Engineering Department at Mississippi State University, holding a Chair position for the Center for Advanced Vehicular Systems (CAVS) in Computational Solid Mechanics, and is also a Giles Distinguished Professor at MSU.